The people of Lesvos and migration have been a synonymous phenomenon throughout the ages. Whether it was the struggle against difficult natural elements, population growth or diminishing opportunities, the people of Lesvos used their sea-faring spirit to travel to the other side of that mysterious sea. Others settled far away; others returned to their homeland. Others visit from time to time; others were never seen again. Syndesmos.net is an visual migration website designed to connect the people of Lesvos, no matter which corner of the globe they are found. Establishing this Website provides Mytileneans with the unique opportunity to search for relatives, friends or villagers from their Island. Above: Sydney, 1946. Panagiotis Angelis and Efstratios Mihailaros, of Agia Paraskevi, arrive in Sydney and are welcomed by "horiani". 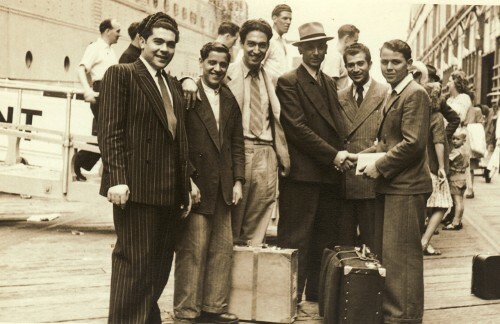 L-R: Konstantinos Tsakiris, Panagiotis Angelis, Andonios Prodromos, Pericles Koulmandas, Christoforos Hatzimoutafis and Efstratios Mihailaros. Konstantinos, who was a partner in the Blue and White Cafe, had come from Goulburn, whereas Pericles, who owned the White Rose Cafe, had come from Ariah Park. Once the Second World War was over and communication between Greece and Australia was re-established, migation re-commenced. Panagiotis and Efstratios represent the first wave of post-War migrants.